Pele: 'Fifa needs honest people' Jump to media player Football legend Pele has been speaking exclusively to the BBC about the Fifa corruption scandal. Cloud of corruption now over - Dyke Jump to media player Football Association chairman Greg Dyke says Sepp Blatter's resignation as Fifa president is "great news for football". Blatter 'does not take money' says daughter Jump to media player The daughter of re-elected Fifa President Sepp Blatter has said her father is not the "person who is taking money". Is this Fifa's biggest crisis? Jump to media player Following the announcement of two criminal investigations into corruption at football's world governing body, the BBC's Richard Conway asks if this is the biggest crisis Fifa has ever faced. How Sepp Blatter charmed Africa Jump to media player Sepp Blatter has been re-elected as president of football's world governing body, despite widespread allegations of corruption at FIFA. Fifa sponsor demands investigation Jump to media player One of Fifa's main sponsors, Sony, calls for an investigation into the decision to award the 2022 World Cup to Qatar. The Brazilian football legend has given his reaction to Sepp Blatter's decision to step down. Speaking exclusively to the BBC, he said: "I want to see football put people together, stop the war. That's my position because this is what football put people together. What happened with the corruption, this is not my problem." 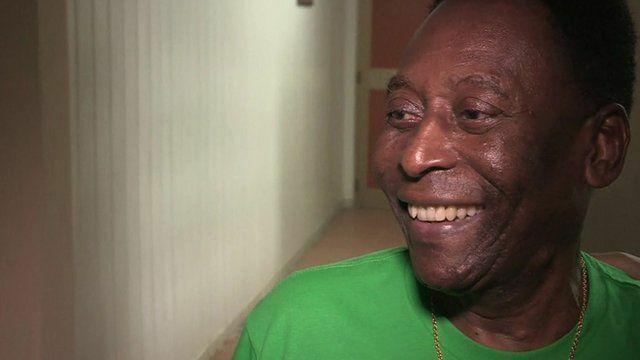 Pele spoke to the BBC in the Cuban capital Havana, where he was attending a friendly match between the New York Cosmos and the Cuban national team, which the Americans won 4-1.